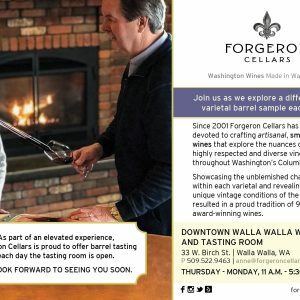 Forgeron Cellars Walla Walla Tasting Room, 33 W. Birch St.
Join us as we explore a different single varietal barrel sample each month. As part of an elevated experience, Forgeron Cellars is proud to offer barrel tasting each day the tasting room is open. WE LOOK FORWARD TO SEEING YOU SOON.